What sounded like a good idea to state officials last May — allowing campers to reserve sites at 16 rustic state forest campgrounds — didn’t turn out to be the bargain some thought it might be. Campers complained about the added costs. They didn’t find the service useful, according to Michigan Department of Natural Resources officials, who say the rustic-camp reservation program will be scaled back for 2013. “The majority (of campers) were not excited about it,” said Tim Schreiner, manager of Traverse City State Park and the man appointed to usher the state forest campground program into a new era. Administration of the program was shifted last spring from the DNR’s forest resource division to its parks and recreation division, which manages state parks. “A lot of customers said, ‘Why spend eight dollars for a reservation when the campground wasn’t filled up to begin with?’ They would rather we didn’t do reservations. They didn’t see a need for it,” Schreiner said. Reservations will be accepted next year only at four locations. Those sites are the rustic cabins at Little Presque Isle in Marquette County, Elk Hill Trail Camp and group camping in Pigeon River Country, Lake Margrethe State Forest Campground in Crawford County and Big Bear Lake/Big Bear Point State Forest Campground in Otsego County. The change, in many respects, could have been predicted. Reservations for the remote campgrounds seemed a bit like overkill, a well-intended carryover from the service-intensive orientation at their more highly developed kin, state parks. But the allure of state forest campgrounds is their simplicity. The change is one of several on tap for the rustic campground program, which now is getting an infusion of new money and fresh thought. Michigan’s state forest campground system has needed both. 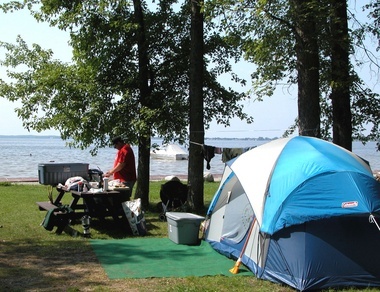 The DNR owns 132 such campgrounds. Four are managed under lease by local municipalities. That might increase in the future. The campgrounds are generally small, rustic affairs, often in remote parts of state forests. Most are on water and/or trails that are used by paddlers, anglers, hikers, skiers, horseback riders and others. They are by and large a good deal and popular with hunters. I’ve used them many times and often prefer them because they are uncrowded and less likely to be inundated with Chinese lanterns and hordes of kids on bikes. But the program for years suffered from underfunding and triage thinking within the DNR because of financial constraints. Budget worries now are easing as 7 percent of state recreation-passport revenues trickle down to campgrounds. The program got $442,915 last year from recreation passport revenues. It is getting $540,617 this year. Public participation in the passport program rose from 24.7 percent to 27.3 percent, according to Jacklin Blodgett, section chief of the Program Services Section of the DNR’s parks division. General-fund allocations also increased from $249,900 last year to $266,000 for fiscal 2013 — a reversal of the severe cuts seen in recent years, though still only about half of what the campground program got in 2010. What that means is that some may be reconfigured. The term Schreiner uses is “right-sizing.” That could mean combining campgrounds, such as the ones at Big Bear Lake and Big Bear Point — and, in fact, that’s a change campers can expect next year. The move will save money, he said, by consolidating campers in one area and lessening the expenses of maintaining and licensing a second campground with roads, pumps, toilets and picnic tables. “There are a dozen to 20 facilities that will be right-sized,” Schreiner said. Customer service is another area Schreiner and others tried to improve this summer by having staff more regularly visit campgrounds and interact with campers and more frequently check fee pipes. The campgrounds have operated on an honor system, and officials assumed 30 to 50 percent of campers weren’t paying. “What we found, much to our pleasure, is that the majority of customers (95 percent) were complying and what we thought might be a challenge was not as bad as we thought. We sent out very few letters for lack of payment. That might change, of course, if more people come to know about the rustic campgrounds. Marketing for the program has been almost nonexistent. But after years of being relegated to bottom-drawer status at the DNR, the rustic campground program has been pulled out and is getting a polish and serious attention. That’s better than have it gather dust and appear more like something to throw away. It is far too much of a gem for that. This entry was posted in Uncategorized and tagged Camping, Lake Margrethe, Michigan Department of Natural Resources, State Forest Campgrounds. Bookmark the permalink.